In this section, the philosophy and values of education will not be discussed but most of you will be surprised to know that in these days, Machines e.g.Computers can even hear and understand your dictations to provide you a written copy or to transmit that to your friends and relatives instantly, even if they are on the other side of this Globe or walk on the surface of the Moon or Mars. This “Information Storage and Transfer Technology” is another modern addition to our society from the brains and the hands of Electrical Engineers, Mechanical Engineers, and the “Software Designer”. Before ending, it must be added here that IST intends to keep a low Student to Teacher ratio for proper care & attention to each and every student. The Government’s regulations on reservation for SC/ST and OBC will always be observed to cater education to the deprived section of Indian Society-at-large. The Institute is proud of the achievement of its students. Our student got the University ranking in the last semester examination announced by WBUT. The students of our Institute are very serious and attentive to their studies. They utilize the lab and library facilities at the maximum. Founder Director of our Institute is very young, dedicated and motivated. Being a noted academician he himself looks after the overall academic aspects of the Institute. He is like the friend and philosopher of the students. Whenever the students have any confusion on any particular subject, they directly come to faculty who helps students to make them understand the basic principle of the subject in a simplest way. He keeps a vigilant eye on the performance of faculties and applies his knowledge and experience to maintain fair and amicable teacher-student relationship. The Director always thinks the betterment of the Institution and he has the plan in his mind to shape the Institute as a Center of Excellence for higher studies and researches in science, technology, engineering and management, particularly in emerging areas. He is used to make things done in its right way and direction. The basic objective of the Institute is to organize undergraduate courses of study in engineering and technology. But IST family, has the thought in his mind to extend and incorporate other field of studies at this Institute, so that the passed out students of IST after completion of B. Tech. Degree can avail Post Graduation to Doctorate studies under same roof. 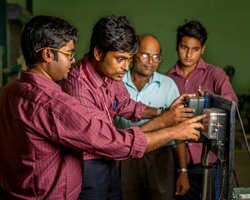 Institute of Science & Technology, by virtue of its cutting edge quality of education, the uniqueness of its teaching learning process and the continuous emphasis on the all round development of students, has created a niche for itself. A harmonious integration of valued traditions with modern outlook is the guiding principle behind the development of academic environment of the Institute. Beside the required curricular activities, students are exposed to number of other programmes like group discussions, interactive seminar, brain-stroming sessions etc. All designed to expand and bring about zualitative growth. Through such programmes, students are constantly mitivated and encouraged to develop their leadership qualities and improve their communication abilities. There is constant endeavour on the part of the members of faculty and staff of this Institute to help students in this grooming process. Although the assesment of the students' performace is generaly guided by the prevalent regulations of the University. The respective course teacher also adopts a continous evaluation system independently in the Institute. Classroom are equipped with teaching aids like OHPs, LCD Projector, PA System etc. 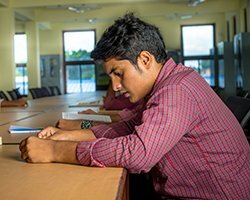 Members of faculty are available beyond class hours for clarification of doubts, problem solving sessions and remedial classess are also held. A student counselling cell is provided for guidance, counselling and psychological boost-up to students. Student seminars are organised in each department to improve their innovate faculty and presentation skills seminars / workshops on recent developments in technology & management are frequently organized with speakers from academia and industry. The language clinic provides training is Spoken English, Mock interviews are organized so that students can face their job interview confidently. Periodical meetings between students & trusees, teacher & parents/guardians are held to get feedback regarding teaching and learning in the Institute. Unique pedagogical methods are followed throughout the teaching learning process. "Students are given special training on modern technologies not in syllabus in free of cost". Students are given extra projects for developing their skills in modern technologies. Copyright 2016 © istonline Terms and Conditions .